It might seem odd to find touch technology within an industrial environment. After all, industrial environments often are dirty, and touch screens seem to need pristine conditions. The perception is false; many touch screens are designed for use within automotive and manufacturing industries. 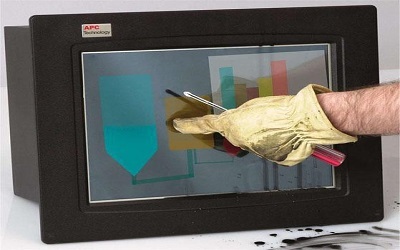 Such screens are housed within durable, industrial-grade designs, and the touch technologies themselves are designed for heavy use or application where the environment may be prone to dust, spills, and other hazards. In addition, many touch screens can be protected with touch overlays , ensuring a long life for the monitor or display. The industrial sector is a varied one. It includes shoe manufacturers as well as home appliance manufacturers. It can range from automotive repair shops to the producers of consumer electronics. No matter how varied those individual industries are, they can benefit from touch technologies incorporated into an automation system, a point-of-sale (POS) display. Which touch technology is the right one for businesses within the industrial sector? The question isn’t a black-and-white one. In most cases, the technology used is dependent upon a number of factors, such as the environment, the lighting, and the amount of use. The outer shell, too, is dependent upon the environment. Some businesses require a stand-alone touch monitor while others need to be able to integrate a touch system within a current design. TouchSystems can facilitate both requirements with its line of industrial chassis design monitors, all-in-one panel PCs, and open frame monitors. TouchSystems also can help with deciding which monitor or display or touch technology would be best suited for a particular environment.